The eastern side of Orangefield Park seen from close to Houston Park. 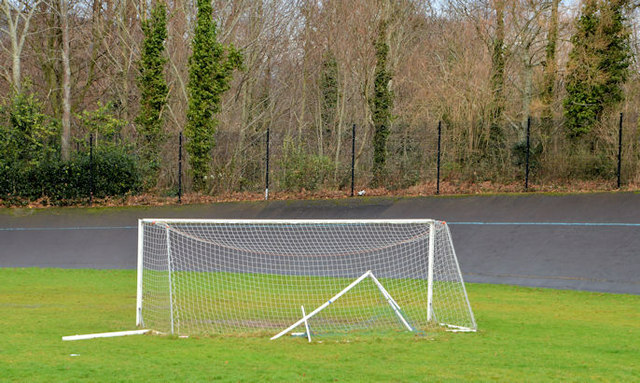 The hockey goalposts seem to be disused. The cycle track/velodrome (background) opened in 1957 and is still in use. Greenville Park and Orangefield Park are parts of a park and playing fields between Grand Parade and Houston Park in east Belfast. Ulster Bank Knock started in 1925 as a daily sub-office from Connswater. The original premises housed a confectioners, who vacated on a Saturday afternoon with the bank opening on the Monday morning. The first customers, unaware of the change, apparently asked for “twopenny worth of ju-jubes” and “a threepenny ruler”. The bank purchased 378 Upper Newtownards Road, then a private house known as “Sandiacre”', in October 1927 and the branch opened there on 1 January 1930. It had no managers of note but its sub-office at Dundonald was the subject of an armed raid on 3 August 1962 when the officer-in-charge was threatened by a revolver-wielding raider. After a scuffle, he was locked in the wash-room and a small amount of cash was taken. Having broken a window to attract attention, the official was soon released but the miscreant was never traced. Information from "Decades of the Ulster Bank", written by William J Knox and published by Ulster Bank in 1965.